Ben Wilson, pictured back in 2015. He will take o the track at Silverstone over the Easter weekend, April 19-21. 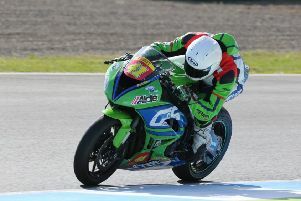 Wilson is to return to race action with Gearlink Kawasaki, the team he has been with for a number of years. The Kirton rider has been taking in some pre-season testing at Portimao in Portugal and more recently the official British Superbike test at Silverstone last Tuesday. He is under no illusion that it will be a difficult task for him to be up at the front of the field immediately. “After being out for the last three years, whatever I do this weekend will be a bonus,” he said. British Supersport: Friday - free practice one 9.40am, free practice two 2.50pm; Saturday - qualifying 11.30am, sprint race (10 laps) 5.10pm; Sunday - warm-up 9.52am, feature race (26 laps) 3.40pm.